This is the first thing you should do when you get home. After being in your heavy boots the entire day, your feet are tired. For you to relax, you should remove the heavy boots and wear lightweight comfy shoes. If you can, you should walk around the house barefooted, or with flip-flops. If you don’t have any activity in the house, you should simply rest on your chair or any of your favorite spots. When you are resting, place your feet in an elevated position. When you do this, you aid in negating gravity, and you allow the blood and lymph fluid to leave the lower legs and return to the circulation system. The best position to elevate your feet is at the level of your heart. You should consider elevating your feet using pillows, but be cautious that you don’t hamper effective blood flow by crossing your ankles. Warm water not only relaxes your feet, it also relaxes your entire body. It also has been shown to reduce pain and swelling resulting from muscle tension. You should start by filling a tub or bucket with warm water that is enough to cover the tops of your ankles when you submerge your feet. You should then add a handful of Epsom salts to the water and agitate the mixture until all the salts have dissolved. The magnesium in the salts aids in relaxing the muscles. If you have them, you can add floral or peppermint oils to the water. You should soak your feet for 15-20 minutes. If you aren’t in a hurry, soak until the water gets cold. Once you are done, remove the water from the tub and dry it gently with a towel. When you are warming the water, avoid making it too hot as the water will pull the fluids from your body and start dehydrating you. Not everyone likes water. If you are one of these people, you should consider soaking your feet in cold water. You should fill a bucket or tub with tepid or cool water and a few cups of ice. You should then add a drizzle of tea tree oil or over the counter foot soak solution of your choice. Submerge your feet in the water for 30 seconds after which you should towel dry them. When drying the feet, you should remember to rub between the toes and along the foot pads to increase circulation. 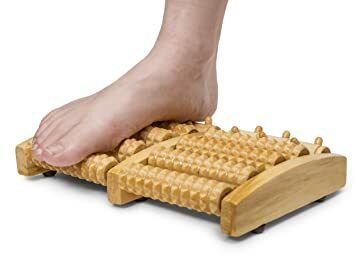 If you have been experiencing mild or moderate discomfort, you should consider massaging the discomfort out of your feet by rolling your tired feet over a wooden roller. You need to place the roller on the ground perpendicular to your feet and firmly roll your feet back and forth for at least 10 minutes. If you don’t have a roller, you can purchase it online or from your local drug store. There are also plastic, metal, and glass rollers that you can go for. For you to get the most from the rollers, go for those that are grooved or ribbed. A foot massage reduces muscle tension and inflammation. The practice has also been shown to break down scar tissues and promote better flow of blood. You can hire a masseuse to do the massage, but for better results, you should visit a therapist. The cool thing about working with a therapist is that he/she will even perform trigger point therapy on the soles of your feet which leaves you even more relaxed. After the massage, you should drink a lot of water to flush out the inflammatory by-products, toxins, and lactic acid from your body. If you don’t have the budget to hire a therapist, you should do the message on yourself. Start by rubbing peppermint extracts, camphor, rosemary, or tea-tree oil into your palms and along your fingers and fingertips. Using your thumbs, firmly press into the soles of your foot. You should stroke the footpad slowly from the base of the toes towards the heel. For maximum relaxation, spend extra time at the ball and arch of your foot. You should wring your foot with both hands while moving your grip back and forth, as you move across the midsection of your foot. If you desire, you should pop your toes by tugging on them firmly, but gently. This is simple and won’t cost you anything. Start by standing or sitting back while pressing the ball of your foot against a solid surface and settle your foot at least 45 degrees from your body. You should stretch for 15-30 seconds by bringing your heel towards your body and keep the ball of your foot pressed against your solid surface. For ideal results, you should repeat this three times for each foot. If you have the time and live near an acupuncture center, you should try it after work. The practice involves sticking very thin needles into specific energy points within the skin and in the process, you reduce pain and inflammation. Acupuncture can be administered by a wide range of health professionals including physicians, naturopaths, massage therapists, physical therapists, and chiropractors. You should always ensure that an expert administers the acupuncture. These are some of the ideas on how to relax your feet after work. If you find that you are having some discomfort even after relaxing the feet, consider getting medical advice. One of the best things you should do is to visit a podiatrist. This is a foot specialist who can treat a wide range of foot problems.